Doina Saxman, M.D. has been a practicing physician for over 30 years. Dr. Saxman's specialized approach to medical care and treatment is to combine her extensive medical experience as a Physician with her understanding of Traditional Chinese Medicine (TCM) studies in Acupuncture and Herbal Medicine. She provides each patient a unique treatment plan that combines Eastern (TCM) and or Western (MD) treatment techniques. After a successful academic career as an Assistant Professor at the University of Medicine and Pharmacy "Victor Babes" Timisoara Romania, and practicing medicine with expertise in General Medicine,Pediatrics, Nephrology and Homeopathy in Romania, she moved to the USA, following her spouse. In USA Dr. Saxman became a KY licensed Physician and practiced General Medicine with special interest in Musculoskeletal Pain, Headache, RSD, Addiction and Psychiatric Conditions. Her life time interest in Alternative Medicine was materialized when she attended the Comprehensive Training Courses for Physicians and was certified in both Acupuncture and Herbal Medicine at University of California Irvine, School of Medicine, Susan Samueli Center for Integrative Medicine University of Chicago, Pritzker School of Medicine, Tang Center for Herbal Medicine Institute for Medical Studies, Academy of Pain Research San Francisco. In the effort to offer the best and most updated health care to her patients, Dr. Saxman is devoted to permanent Continuing Medical Education. She is a 2004 Medscape CME Acknowledgement program Winner. Since 2004 to present she completed over 1500 credits AMA PRA category 1 credit physician. Dr. Saxman had the highest privilege to study TCM Acupuncture and Herbal Medicine from the faculty with prestigious names such as Tsun-Nin Lee, MD Director of Academy of Pain Research, John Longhurst MD, Ph. D., Professor of Medicine and Associate Dean amueli Center of Integrative Medicine, School of Medicine University of California, Irvine, Terrence Oleson, Ph.D., Professor of Psychology California Graduate Institute, UCLA Pain Control Unit, Yeong Chiu MD, Ph.D. Visiting Professor UCSF School of Medicine, Chan Gunn MD Clinical Professor Dept. of Anesthesiology University of Washington School of Medicine, Peng Li MD Former Professor and Head Dept. of Physiology, Shanghai Medical School China and many others. Dr. Saxman is proficient in treating each patient with individualized schemes by combining most effective Acupuncture Points of the Body, Extremities, Ears and or Scalp where the ultimate goal is to enhance the beneficial outcome. Also she associates Electro-acupuncture, Cupping or Gua Sha massage or Chinese Herbs to restore the balance of the body. 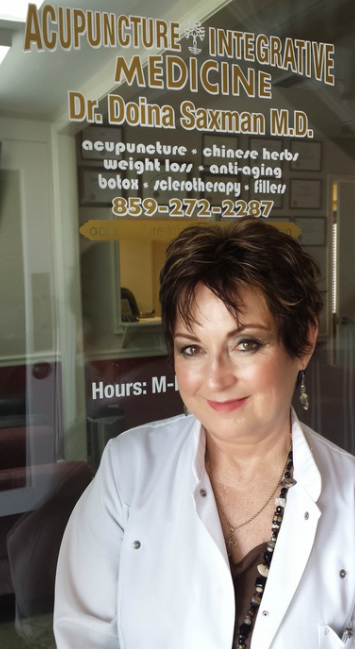 Also Dr. Saxman has studied and received certification in Anti-Aging, Weight Loss and Aesthetic Medicine.